1 photograph : b&w ; 20 x 23 in. File contains a composite photograph of the Dalhousie University Faculty of Law class of 1906. The photograph consists of portraits of B. D. McDonald; M. Elliott; W. S. Morrisey; L. A. Seller; G. H. Sterne; J. W. G. Morrison; W. A. Henry, L.L.B. ; J. A. Chisolm, L.L.B. ; A. A. McGillivray; J. E. Chisolm; H. A. Lovitt, L.L.B. ; H. McInnes, L.L.B. ; A. D. MacIntosh; J. B. Lyons; B. T. Graham; B. Russell, J.S.C. ; Dean Weldon, Ph.D., K.C. ; W. B. Wallace, J.C.C. 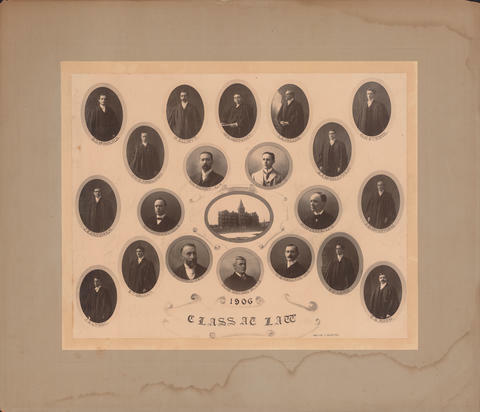 ; E. C. Locke; and E. B. Ross arranged in several rows with a photograph of the Forrest Building.